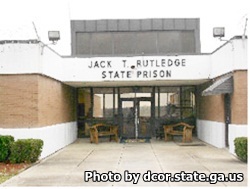 Rutledge State Prison is located in Columbus Georgia, part of Muscogee county. It is a medium security institution that can incarcerate up to 640 adult males. Inmates in the general population are held in two man cells. There are six separate living units within the institution in addition to this, there is a medical and mental health unit as well as a segregation unit. Offenders can work both on and off institutional grounds in landscaping and maintenance, laundry, and the cafeteria. Inmates can earn their GED, get an adult basic education and expand their reading skills while incarcerated. Counseling is available for a multitude of mental health issues, including post traumatic stress disorder and schizophrenia. Substance abuse treatment and anger management counseling is also available. Group therapy and support for inmates who are serving life sentences has helped changed the behavior of many inmates. Vocational courses offered at Rutledge State Prison include clerical, custodial, warehouse, culinary, laundry and barbering. Visitation occurs on Saturdays and Sundays from 9am-3pm. Inmates can also have visits on State recognized Holidays from 9am-3pm.